Grace Kendall knew back in seventh grade that she didn't want to cut open a preserved frog. Her teacher allowed her to use a computer alternative, and she has declined to dissect ever since. "I thought there was something really wrong with dissecting a dead animal when I knew there were other options," she said. "Dissecting something that was killed so we could learn about it was unsettling." Now a junior at Stafford High School, Grace is glad that Virginia has joined a handful of states that have enacted laws allowing students to opt out of dissecting fetal pigs, cats, earthworms or other animals. Starting this academic year, all Virginia students must be told they can decline to dissect without penalty and instructors must provide them with alternative learning tools, including computer programs, Internet tutorials and plastic models. The law has surprised some teachers, including Rebecca Ross, who teaches senior anatomy and physiology and 10th-grade biology at Cave Spring High School in Roanoke County. "I don't think there was anybody speaking for biology teachers" when the legislation was being crafted, said Ross, president-elect of the National Association of Biology Teachers. But she agreed that students with "moral, philosophical, religious or ethical" objections to dissection should be able to use alternatives. Such materials should supplement, but not replace, dissection, said Anne Tweed, president of the National Science Teachers Association and a former biology teacher. "They can't get the same hands-on learning." Virginia is among nine states that require school districts to provide dissection alternatives. Florida was the first to pass such a law, in 1985, followed by California in 1988. New Jersey is also considering similar legislation. Argentina, India and Israel are among nations that have banned dissection in schools. The trend is driven in large part by animal-welfare groups such as People for the Ethical Treatment of Animals and the Humane Society of the United States, which encourage students to oppose dissection. The groups contend that many animals used for dissection often suffer during their capture, handling and killing, and say the practice devalues animal life. 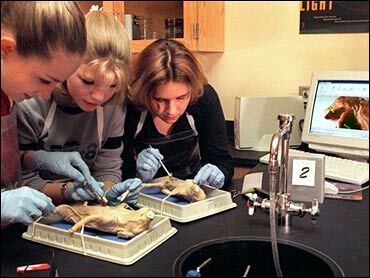 "We believe that dissection in the classroom is an antiquated method of dissection and promotes the widespread abuse of animals," said Jacqueline Domac of PETA. The Humane Society estimates that 6 million animals - mostly frogs, fetal pigs and cats - are dissected annually in American high schools. The society distributes anti-dissection videos and loans alternative software to schools.